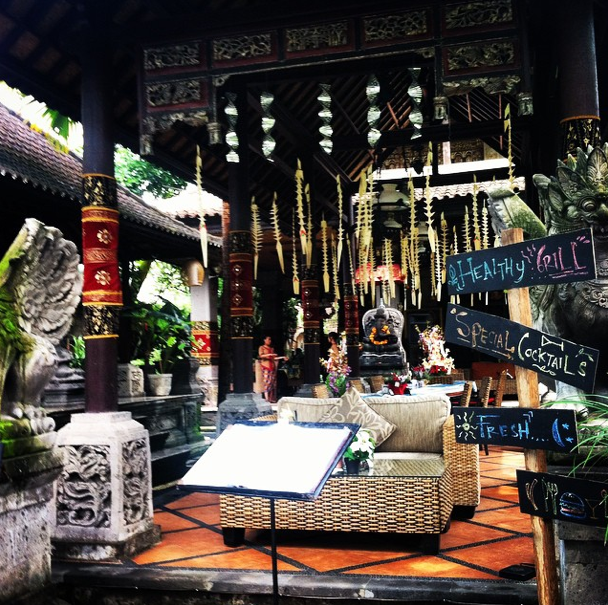 By J. E. Hinners, MD MPH Most yoga fanatics have heard of Ubud, Bali, as it is home to some of the most envied yoga training programs. 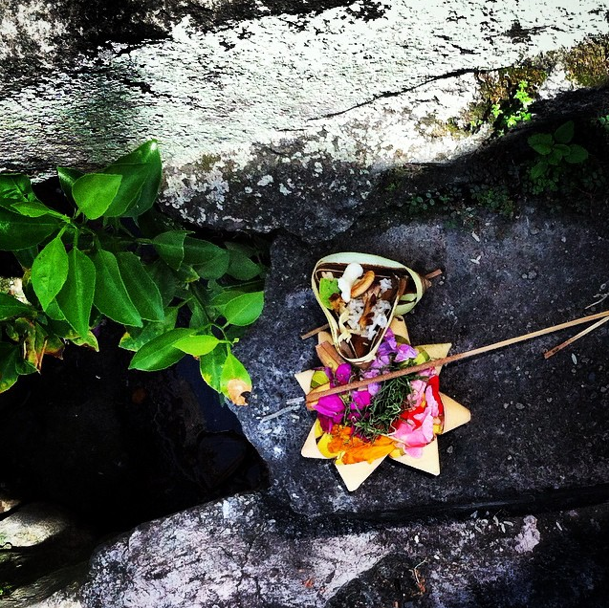 Maybe you’re a yogi at heart, or maybe you’re just curious about Bali. Either way, come take a brief photo tour with me in Ubud, Bali! Ubud is home to Monkey Forest, where monkeys roam freely with humans, sometimes even jumping on the backs of tourists. My first encounter with a monkey, however, was not in Monkey Forest but rather on the street where the Monkey Forest entrance is situated (“Monkey Forest Road”). I was not quite expecting to see any monkeys but was simply on my way to grab some food. Needless to say, I was amusingly caught off guard…. After capturing my cute monkey picture, I hit the grocery store where I bought myself some bananas and a cold, bottled coffee. It’s a lot nicer in the inside than on the outside. Good food choices. A Westerner will probably feel somewhat normal here. 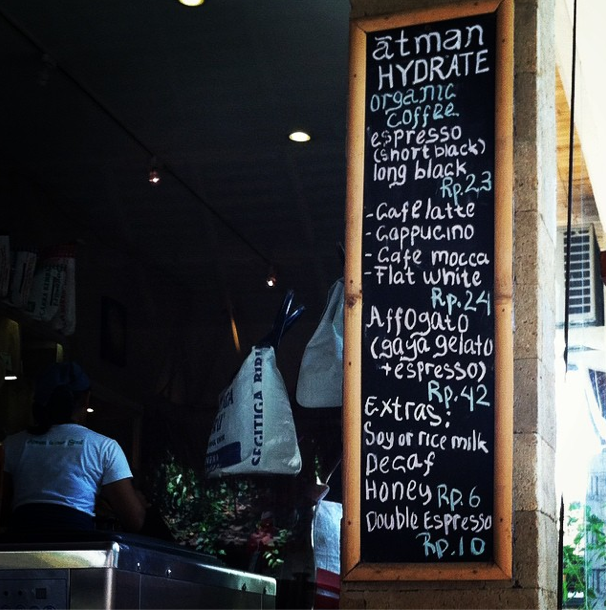 Best bottled cold coffee deal I could find (6,000 Rupiah, or $0.48). 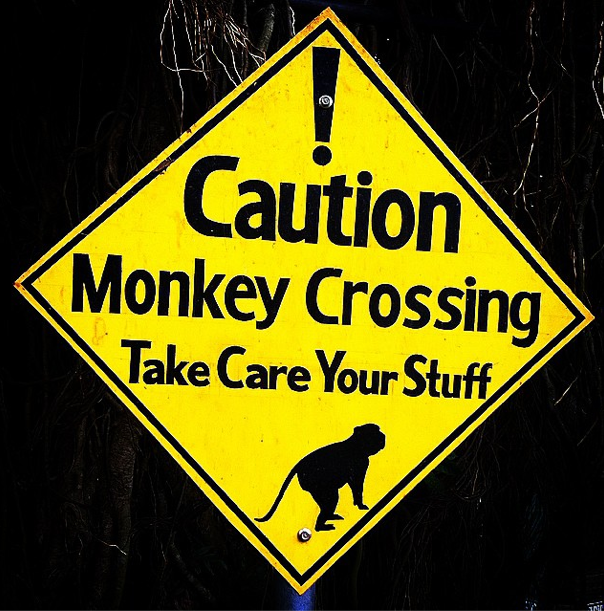 On my way back, I ended up getting robbed in the street…by that “cute” little monkey. Of all grocery items I had to buy, I had to buy bananas. “Cute” monkey came racing towards me and started pulling at my bag of bananas. For a minute there, it was just me versus him–pulling at the bag. He won. And I felt pretty lame. Well, now that I was out of my food supply, I decided to turn to some local restaurants. 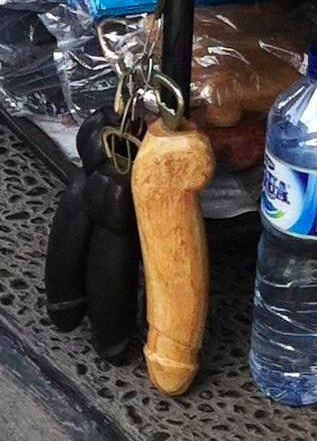 If you’re on a budget, you may be happily surprised to find that eating in restaurants in Bali is often cheaper than buying food from the grocery store…and perhaps a bit safer, if you don’t want to be attacked by any monkey thieves. 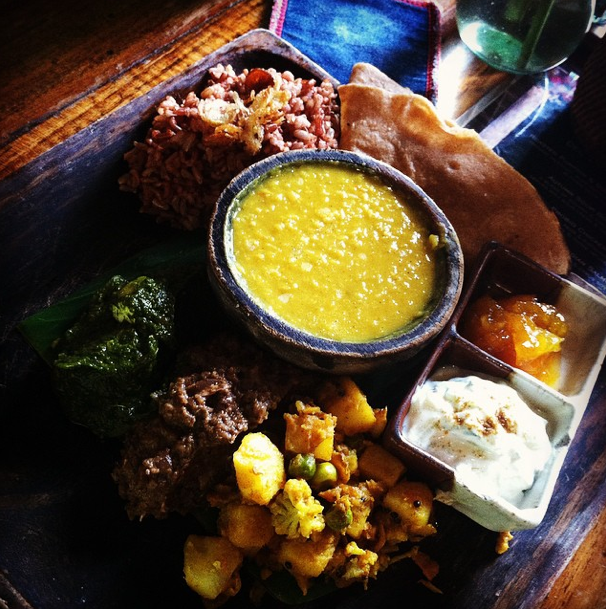 The second bit of wonderful news (if you’re a health nut, in particular), is that Ubud’s local restaurants and cafes boast some of the world’s healthiest food items I have ever seen in any city I’ve visited all over the world. Do you eat organic? Well, you’ve come to the right city. Are you vegan? No problem. Do you eat gluten-free? Gotcha covered. 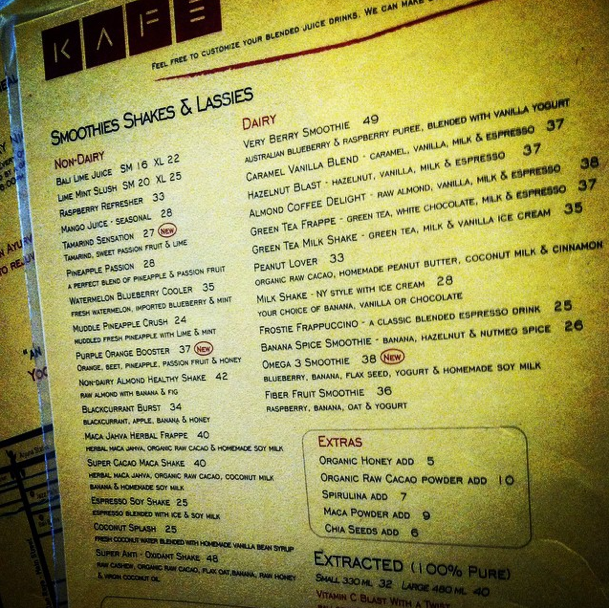 Special mention goes to Kafe on Hanoman St., one of my favorite regular spots. 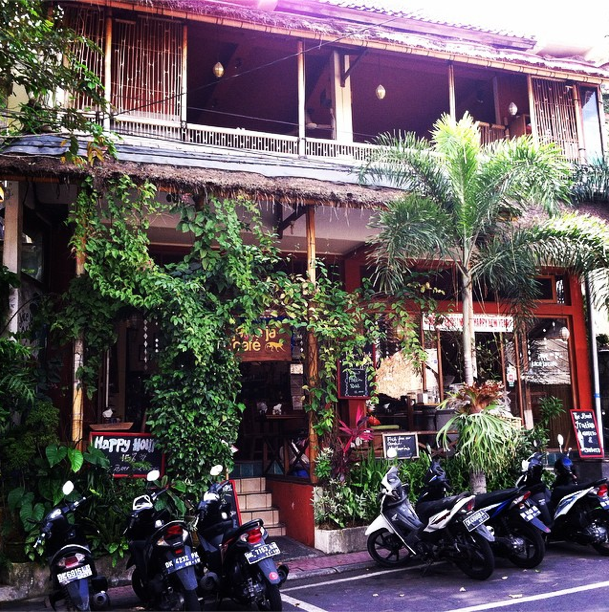 While most cafes and restaurants in Ubud offer free wifi (as does Kafe, also), Kafe has indoor air conditioning which proves to be a lifesaver when you can’t escape the wet heat. It also feels very comfortable as a female Westerner eating alone at night. While I love many of the other local restaurants and cafes in Ubud, and being around tourists and expats is not usually a primary goal of mine, this place is a bit of a restorative escape for me if I want to feel “normal” for a little while. 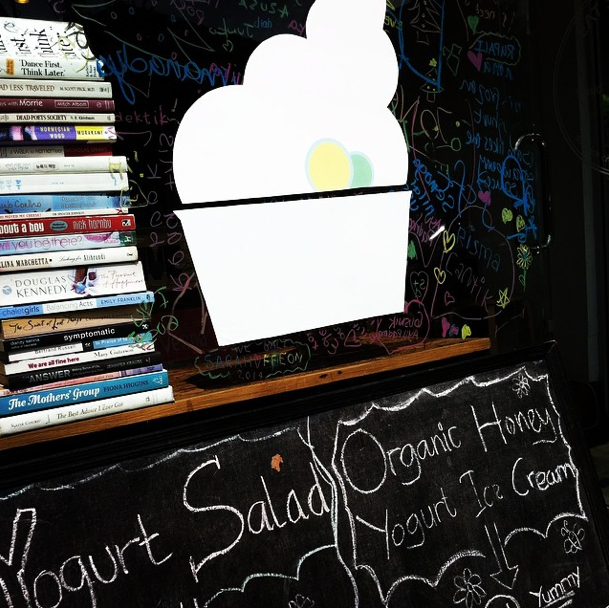 I am also in love with their healthy and creative menu that entices me to keep coming back for trying more dishes and drinks. 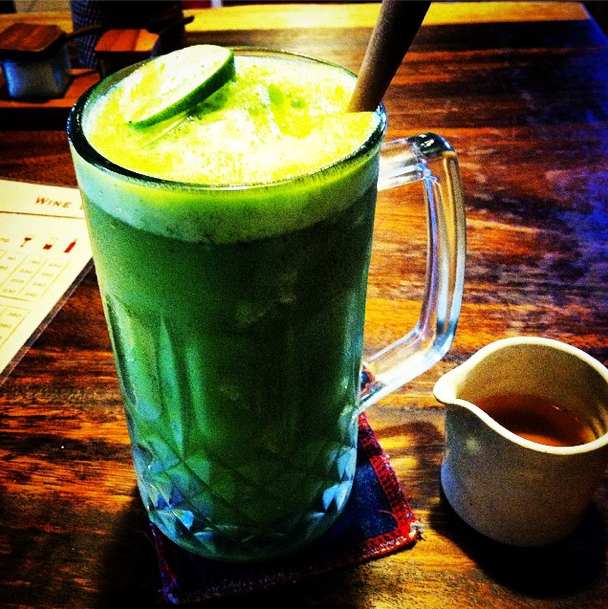 Large Lime Mint Slush…oh so refreshing on a wicked hot day. All drinks are made with reverse-osmosis-filtered water, and you can pay a very small price for them to refill your large and small plastic water bottles with their filtered water. They also offer to take your recyclable empty bottles and recycle them for you. Growing up in the Chicago area sort of hammered into me this strong ethical duty to recycle…hence my odd excitement over this fact. 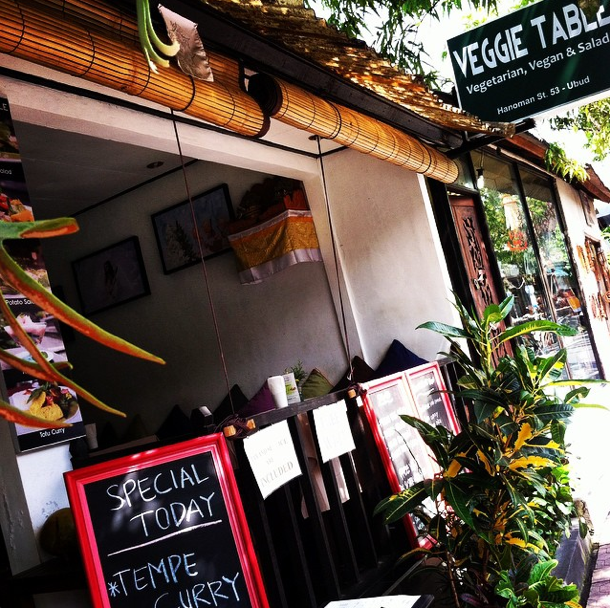 *Unhealthy* food options abound in Ubud, too! I should add that I only had a couple negative experinces at Kafe: 1) the food service is pretty slow because it’s generally understaffed for the number of customers, and 2) the reservation I went out of my way to make for Christmas was pretty much forgotten, so instead of eating at a small table for one that was specified for me, I got stuck at a bigger table with a gentleman older than me who appeared to be in the mood to talk while I had set out to enjoy a meal in solitude at the time. 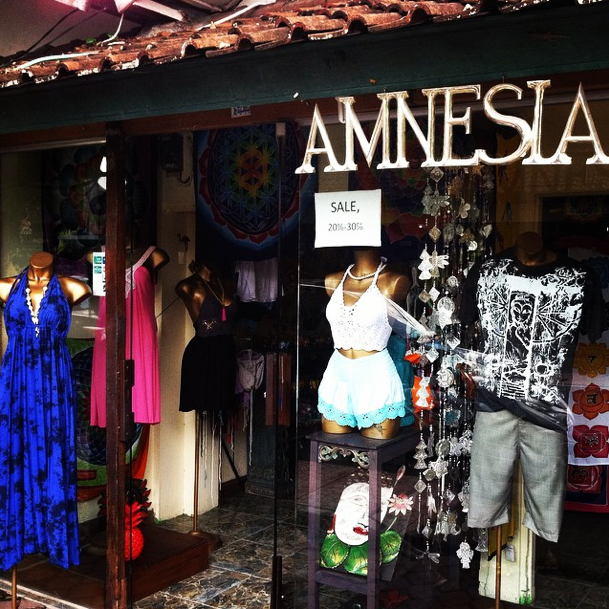 Ubud’s main streets–which basically form a simple rectangle–have a lot of charm, offering much by way of food, fashion, and traditional culture. Are trucks allowed to be cute? And Balinese palaces, of course. 2. “Transport?” – Same as above. Although I’ll admit the change in vocabulary offers some slight relief for the weary ears. 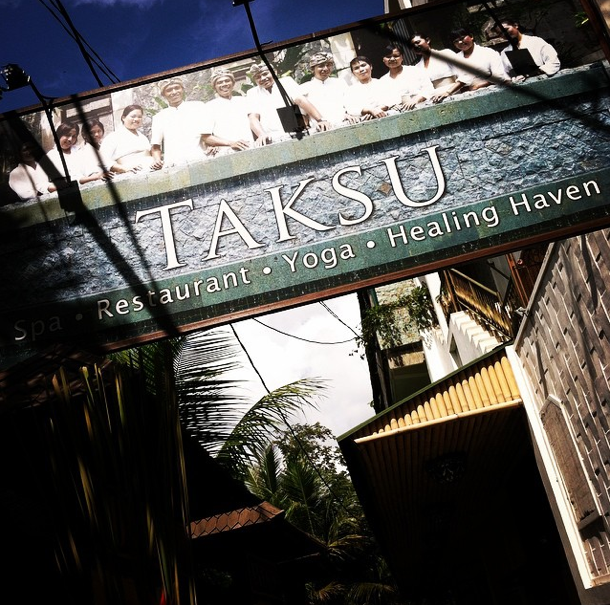 No Ubud article would be complete without some mention of the flourishing yoga scene here. Yogis from all over the world flock here for either a more “spiritual” yoga experience or for intensive practitioner or teacher training. The Yoga Barn is perhaps one of the largest yoga centers here, with class offerings covering nearly every hour of every day. Workshops, teacher trainings, movie nights, and Sunday lunch buffets are also held here. One of the most gorgeous outdoor Yoga Barn Studios overlooks lush green forests and rice fields. 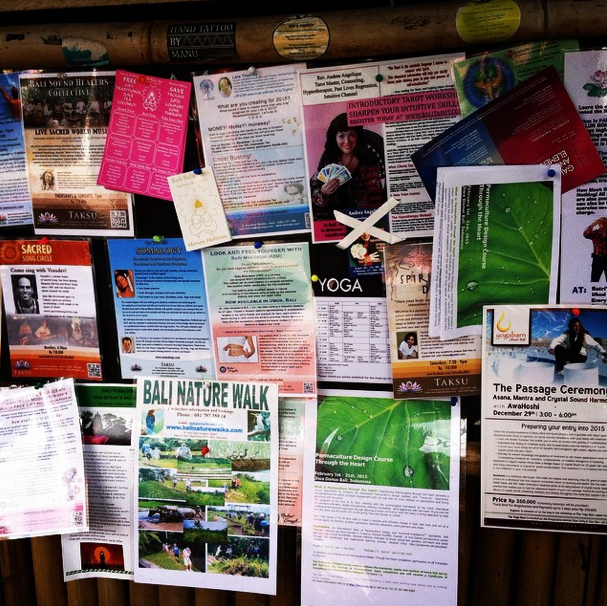 And plenty of additional yoga retreat centers also abound in Ubud besides just The Yoga Barn. If you’re itching for new yoga clothes, no need to bring your own, really–there are a myriad of yoga clothing stores in Ubud. Or…even “transformational clothes” for those more spiritually inclined. All streets above are major shopping and restaurant streets, and worth mentioning is the additional lovely street of Dewi Sita which cuts across horizontally just beneath the top side of “the rectangle.” There are also several fun, little side streets with additional shopping and delicious local Balinese food…but you’ll have to come here to explore where they are for yourself! There are also free maps available via tourist brochures at Kafe and at tourist booths along Dewi Sita and Monkey Forest Road, if your accommodation doesn’t provide you with one. Voltage is somewhere between 220-240V. Just check that your device covers this voltage range; most computers and smart phones do. If you’re using one of those world plug adapter sets discussed earlier, the adapter you might end up using could be labeled as “South Europe, Middle East, Africa, Caribbean”; the label may differ, though, depending the particular adapter set you’re using. 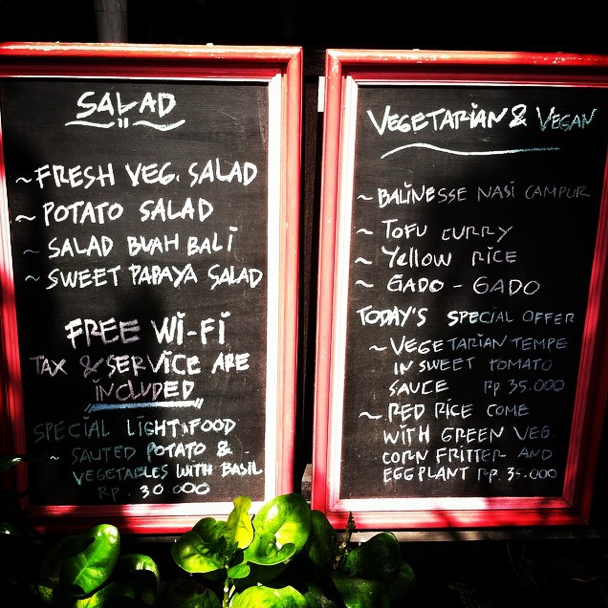 Wifi, as mentioned earlier, is available in nearly every cafe and restaurant in Ubud (although I didn’t find this to be as true in Seminyak, for those planning to hop down closer to the beach). 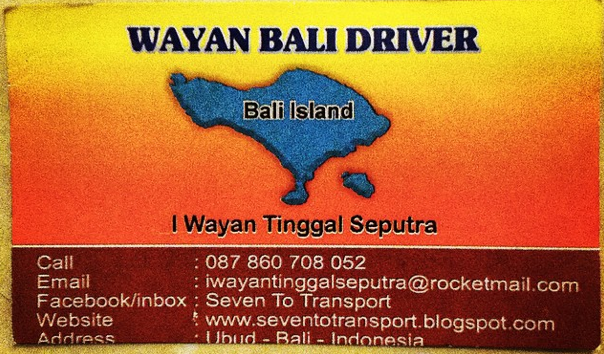 Wayan, the wonderful private driver I used to travel between Ubud and Seminyak (a 220,000 Rupiah trip, or about $18 USD). Tip: if you are planning a trip to a neighboring city where wifi may not be as readily available, keep in mind that Circle K has free wifi and is easily found in most major cities in Bali. The password appears to be the same in different cities, as well (“88888888” at the time of this article). That being said about ready wifi availability in Ubud, the wifi is not quite as reliable as one might find in South Korea, for example. If you heavily depend on regular, reliable, high-speed wifi, it’s probably best to either be prepared to lose wifi at some point or else to plan on purchasing a modem based on local recommendations (apparently, wifi reliability with various companies varies by the different local regions). Another option, if you can afford it, is to check out Hubud, a paid co-working space with high-speed internet and some other office-type services. 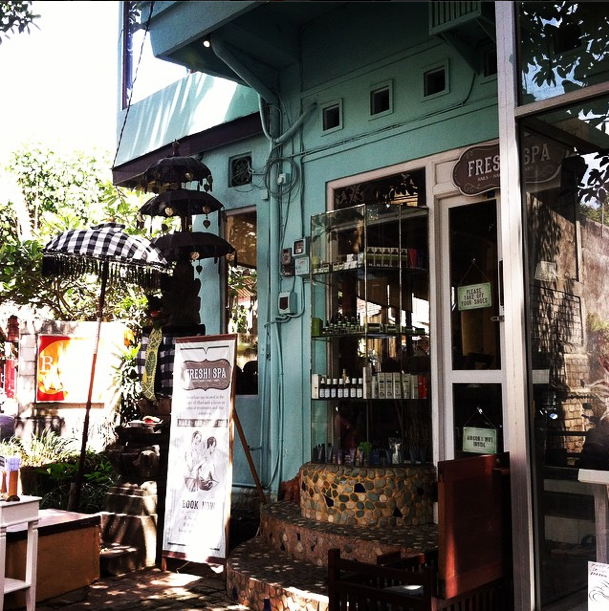 Hubud is centrally located on Monkey Forest Road. Visitors from most countries are granted a visa-on-arrival (VOA) for $35 USD that is good for 30 days (note: that means 30 days, not one month). If you are a U.S. citizen, you need to have $35 USD cash with you to pay for your VOA. Certain nationalities don’t even need a visa at all to enter Indonesia. 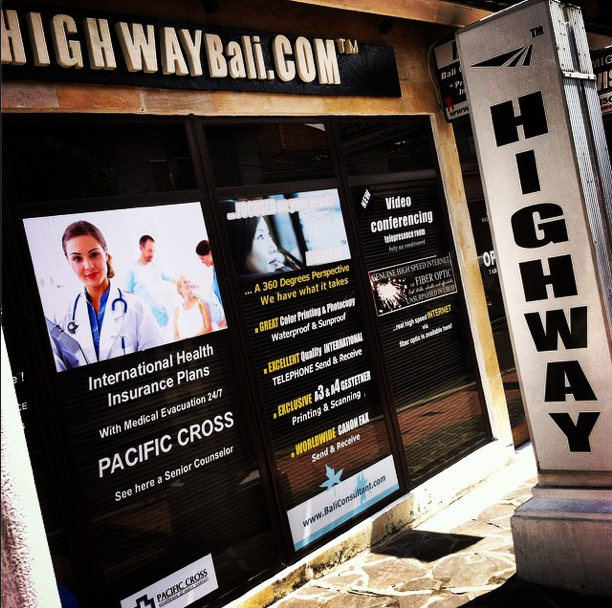 This article isn’t meant to be a comprehensive review on visa information, but I appreciated this site for learning more about Bali visas. If you are in Ubud and looking to either extend your 30-day tourist VOA with another 30 days or with the social visa, you might consider a very popular local agent who offers her quick services at reasonable prices for such purposes: Ms. Komang Suwini. 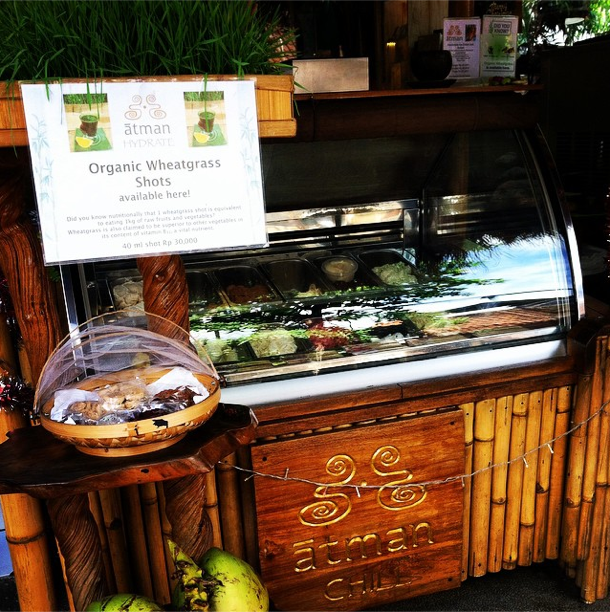 Ms. Suwini appears nearly every weekday around 2pm at Bali Buda cafe in Ubud (across from the post office). Her price for the 30-day visa extension was 600,000 Rupiah at the time of writing this article. I discovered Ms. Suwini through a very helpful Facebook Ubud Community group which is an excellent resource for any Ubud-related questions you might have. She was recommended by more than one person. I just met up with her today, in fact. At first, the meeting seemed rather clandestine-like, as I had had many questions for her by email but was only responded with, “meet me at Bali Buda in Ubud at 2pm tomorrow” (no joke). I showed up, peeling my eyes for a woman whose visual appearance I knew nothing about. No immediate signs of Ms. Suwini…so I ordered lunch. Then I saw several expats and tourist-looking folk taking turns sitting down next to an Asian woman, pulling out their passports one-by-one…. Um…yup, apparently she’s that popular. She was very kind but busy and handed me her card (shown above) for my future needs. Update: I would really like to include an update in this particular section, as I have now renewed my visa in 2 ways: 1) flying out of the country and reentering on a new 30-day VOA, and 2) applying for the 30-day visitor visa extension through Ms. Komang Suwini. My personal opinion is that I strongly prefer to fly out of the country and reenter on a new 30-day VOA instead of applying for the 30-day visa extension. Overall, it was less hassle and even might have ended up costing me less money, as well, since I had taken an inexpensive round trip flight to/from Singapore. In my personal opinion, going through the trouble and money of renewing your visa would only be worth it if you were going for the 6-month social visa renewal (in which case, you’ll still have to schedule a flight out of the country, but then you’re good to go for 6 months). For reasons why I’m not keen on going through the trouble of applying for a 30-day visa extension again, see below. While perhaps my experience might have been the exception to the rule, I did not have the greatest experience, and giving up my passport for about 2 weeks was actually the least of my pains. After I’d given my passport and information to Ms. Suwini, I was told I’d be contacted about scheduling a shared (and reduced fare) transport to immigration in Denpasar the following week for fingerprinting. 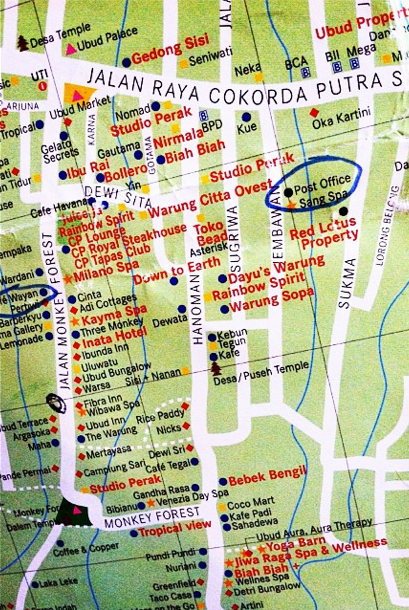 For those not familiar–Denpasar is the city where the airport is located, and it’s about 1-1.5 hours away from Ubud. If you can manage to find shared transport, it’ll probably cost you about 70,000 Rupiah (Rp) one-way (almost $6 USD). If you cannot find shared transport to immigration in Denpasar (the more likely scenario) and you don’t have your own transportation, then you’ll have to pay a taxi at least 250,000 Rp (about $20) one-way (so $40 round trip). 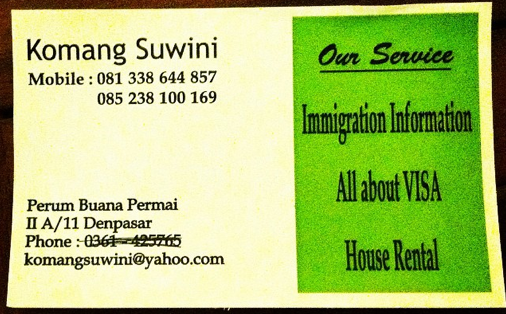 The “following week” came, and I had not heard anything from Ms. Suwini about shared transportation to Denpasar’s immigration office, so I contacted her about the plans. I received an email at night on a Wednesday and was told to show up at Denpasar’s immigration office the following day (Thursday) at 2pm. So apparently, I was supposed to now pay for my own individual transportation ($40 round trip) down to immigration and be available at the last minute to make my immigration appointment. So I did so and managed to trek all the way to immigration and meet up with the particular woman I was scheduled to meet with. The woman told me she could not process my visa today because the computers were down, and they couldn’t take fingerprinting. While this scenario is a classic developing country scenario not all that foreign to me, apparently the computers had been down the day before, also–however there was no communication of this to me by Ms. Suwini who had just arranged my meeting after the time when the computers were down (ie, my wasted trip to Denpasar could’ve been prevented by simple communication). So I had to trek back to Ubud, after having just unnecessarily wasted an extra $40 and more than half a day of my time. Camp out all day at immigration? Finally I got an email that weekend that the immigration computers were ready and I could show up the following week. So I trekked all the way down there again, got my number in line, and waited for fingerprinting…for almost 3 hours…while sweating in the heat, swatting flies every few seconds, and trying to shield my face from the secondhand smoke I was forced to sit next to. My turn finally came, and after the process was done, I went back up to Ubud and picked up my passport in Ubud 2 days later. Was it worth it? NO! Emphatically no!!!! I’ll take a trip to/from Singapore any day over the unnecessarily wasted money and time for multiple trips down to Denpasar any day!! Just hoping my experience can spare someone else the trouble. That being said–I do think it would be worth it for the 6-month social visa extension, just not for the 30-day extension. 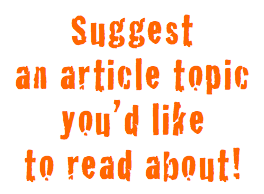 This entry was posted in Travel, Traveling healthy and tagged Bali, health, photos, tour, travel, Ubud, yoga.